Oregon lawmakers passed HB 2210 during the 78th Legislative Assembly in 2015, authorizing certified broadcasters – First Informers – to access their studio and transmitter facilities during a declared emergency. Governor Kate Brown signed the bill which went into effect on January 1, 2016. HB 2210 was sponsored by Rep. John Huffman, Rep. Deborah Boone, Rep. Bill Post, Rep. Paul Evans, Rep. Tobias Read and Rep. Carl Wilson. The Oregon Association of Broadcasters, Society of Broadcast Engineers and Oregon Office of Emergency Management crafted a training and credentialing program for engineers, technicians and Chief Designated Operators of radio and television stations. The OAB encourages broadcast stations in the state of Oregon to certify their engineer or chief designated operator in the First Informer Program so that they will be able to maintain and/or repair equipment that will allow stations to continue to provide critical information to listeners and viewers during a declared emergency. 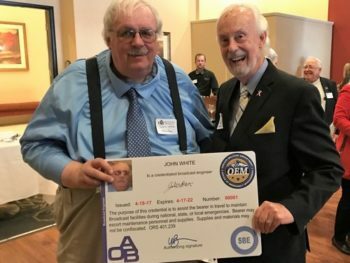 The Society of Broadcast Engineers facilitates the training and testing for the First Informer program, while the OAB maintains the database of certified engineers. 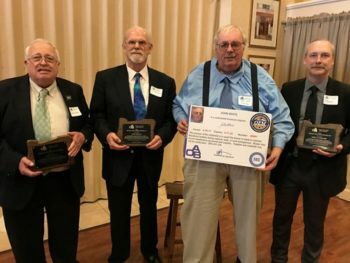 The SBE Team that negotiated the First Informer training/credentialing standards included (L-R) James Boyd, Don McKay, John White and Mike Everhart. Everett Helm (not pictured). John White was presented the first credential under the First Informer program. White led SBE’s efforts to create the training certification and credentialing program. White is seen here with Bill Johnstone, OAB President & CEO Emeritus, who spearheaded the creation of the First Informer legislation. Rep. Carl Wilson (center) co-sponsored HB 2210 which created the First Informer program. 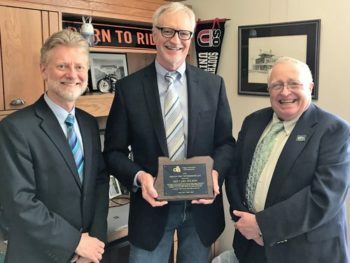 Rep. Wilson was presented a plaque of appreciation during the 2017 OAB Day at the Capitol festivities by Kingsley Kelley (GM of KTVL-TV Medford) and James Boyd (OAB Board Member). 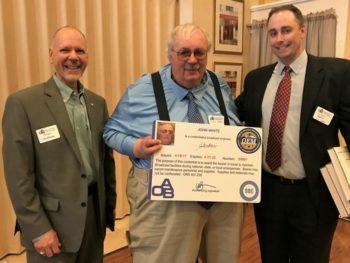 Rep. John Huffman (left) and Oregon Office of Emergency Management Director Andrew Phelps (right) presented John White (center) with the first credential issued under the First Informer program.